To lose weight and offset the health issues associated with obesity, doctors and specialists recommend cardiovascular exercise. The American College of Sports Medicine encourages those looking to lose weight to increase cardiovascular exercise time from 30 minutes three times per week to as much as 90 minutes three or five times a week. This is not so easy for the extremely overweight. The gym is an intimidating place and many of the machines do not accommodate the size and weight of the obese. You may acquire a cardio machine to put in your own home, or utilize one that is friendly on the joints at the gym. Gradually introducing your body to fitness, in short segments, yields the best results for the de-conditioned obese. The treadmill offers the ability to walk at a comfortable, but challenging pace, with or without an incline. The belt offers a bit more cushioning and security than outdoor terrain. The treadmill requires no skill and can accommodate fitness advancements. As you lose weight and become more fit, you can increase the speed and/or incline. Walking is generally low impact, but is not appropriate if you have severe joint issues. 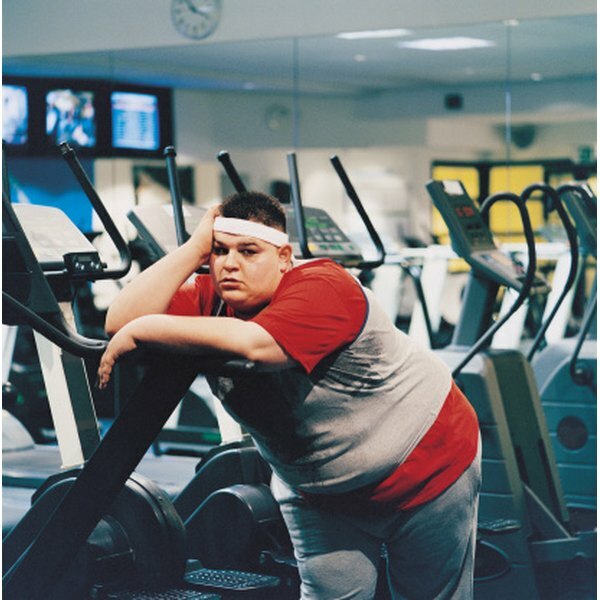 Commercial treadmills, such as the ones you find at fitness facilities, have a weight limit of up to 400 pounds. If you purchase one for home use, ask about specific models' weight limitations. A recumbent bike is like a regular stationary bicycle, but it has a reclined seat and back support similar to a chair. Shoulder-level handlebars alleviate wrist pressure. A recumbent bike offers cardiovascular exercise without impact, thus offering options for obese people with joint problems. It may also allow you to exercise longer because your legs may not tire as quickly from bearing the weight of your body. Home versions of recumbent bikes tend to have a weight limit of only 250 pounds, so be sure to inquire if you purchase one. Commercial bikes may hold a person upwards of 300 pounds, but realize a recumbent bike may not be easy to climb into, and the action of pedaling might not be comfortable given body size. Elliptical trainers combine the feel of cross country skiing with the motion of stepping. Your feet never leave the pedals, so it is joint friendly. Some elliptical trainers come with arm poles that can be manipulated to burn extra calories and include an upper-body workout. High-end commercial ellipticals may accommodate a weight up to 350 pounds, but check with the manufacturer to be sure. An elliptical trainer offers both beginners and more fit exercisers a challenging workout, so it is a machine that will work for you as you become more fit. An inexpensive, convenient option is the portable peddler. The mechanism looks like bicycle pedals attached to a rod, and you peddle from the comfort of your chair. Adjust the tension to increase or decrease the challenge. The harder and faster you pedal, the more calories burned and cardiovascular benefit accrued. You may also use the peddler with your hands if your legs are compromised in some manner.